A super hero. With no powers. Or motivation. 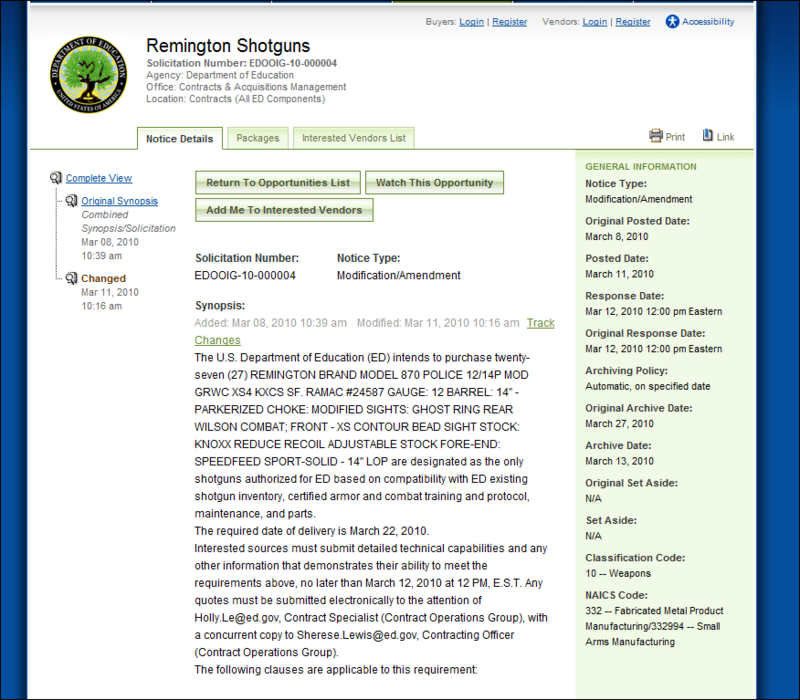 The United States Department of Education is seeking bids from Vendors to purchase 27 (count) 12 gauge Remington Model 870 Police 14″ shotguns, according to the Federal Business Opportunities Website, FBO.gov. FBO.gov is a Federal Website that allows federal agencies to list “business opportunities” and contract fulfillment opportunities to businesses throughout the United States, presumably in an effort to make the Federal bidding and fulfillment process more accessible and fair. To see the bid solicitation, click here. Or, if you’re having trouble, you can always click the image above. designated as the only shotguns authorized for ED based on compatibility with ED existing shotgun inventory, certified armor and combat training and protocol, maintenance, and parts. Why does the US Department of Education have an existing shotgun inventory? Why does the US Department of Education have certified armor and combat training? Why does the US Department of Education need 27 more 12 gauage Shotguns? Is this part of the No Child Left Behind act? Given the opportunity to theorize on my own, I guess there is a possibility these 27 shotguns are for Federally funded gun safety courses? You know, giving high schoolers the opportunity to learn how to use and an operate a shotgun safely? Of course, that’s only one possibility. Can anyone shed some light on this topic? This entry was posted in Politics. on March 11, 2010 by I'm a Super .com. Give power to the people, Congress should limit executive pay!